this is the last one of three Baby Dolls I was working on quite a while now beside of all the custom orders for Christmas. This one also brings her favorite little cuddle doll. 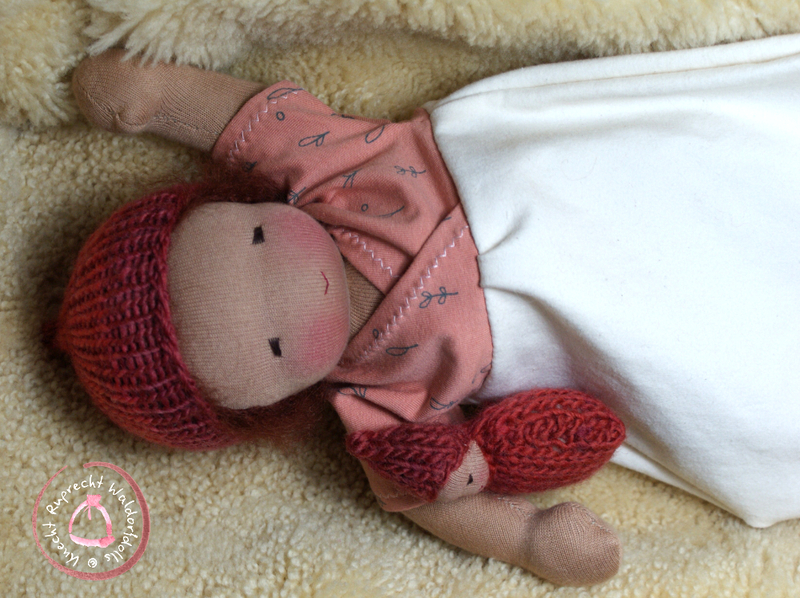 This Knecht Ruprecht Waldorf Baby Doll is individual handmade in Austria with love and great attention to detail. Only the most exquisite materials made from all natural fibers and organic materials where possible are used. Its head and body is sculpted in the traditional Waldorf style and its facial features are hand embroidered. This Baby is designed to look and feel as much like a real baby as possible. It has curved limbs, that nestle well in children's arms and it has a bottom that allows the baby to sit and can be cloth diapered. 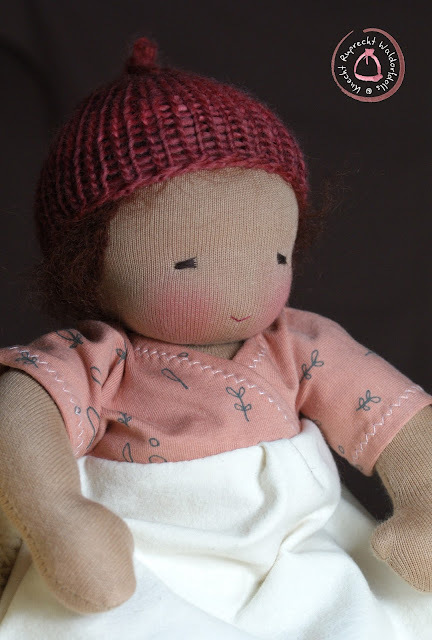 All Knecht Ruprecht Baby Dolls are soft to the touch and stuffed firmly with 100% organic washed and carded wool. The hair of this doll is made of 100% Mohair yarn. This Knecht Ruprecht Waldorf Baby Doll will come with a baby sleeping bag made of cotton fabric one matching hand knit hat of pure lambswool and one cloth diaper. The baby also brings its favorite little hand knit snuggle doll. The soft 100% cotton doll tricot skin is made of high quality swiss cotton. 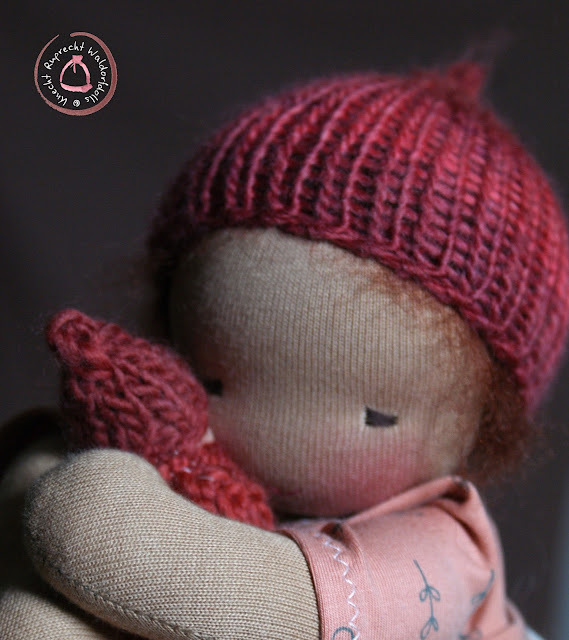 Nearly all wool and felt materials used for my dolls are coming from the local farmers collective Manufaktur Haslach. This Collective supports different rare and endangered species of sheep and organic farming, no pesticides or chemicals are used. The wool is only washed with soda, mild soap and warm water. This Knecht Ruptrecht Doll is made in a smoke free environment with love and great attention to detail. Each and every doll I make is unique and handmade by myself. When cuddled, a wool stuffed doll takes on the warmth of the body, making it come "alive." The appearance is intentionally simple in order inspire imagination and to strengthen creativity. Knecht Ruprecht is dedicated to finest, OOAK artist made Waldorf Dolls for any occasion and for every age. Marie, the artist behind Knecht Ruprecht, is a former Waldorf Student and holds a Master of Fine Arts degree from University of Art and Design Linz. She belives in the importance of Doll Play and it is a pleasure for her to create these important little friends for Children of all ages who accompany them through the most significant childhood years. All types of dolls offered are proved and tested by her own little children and suitable for daily use. 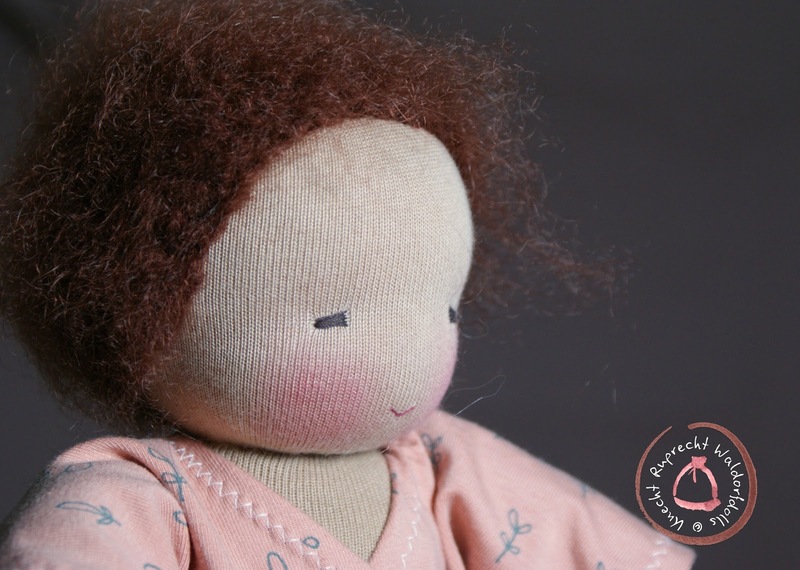 All dolls are handmade in her studio in Austria. Only the most exquisite and organic materials are used. Die Bezeichnungen Waldorfpuppe und Waldorf Puppe sind seit einigen Jahren markenrechtlich geschützt. Aus diesem Grund weise ich ausdrücklich darauf hin, dass alle von mir hergestellten und angebotenen Stoffpuppen, die in Anlehnung an die Lehren Rudolf Steiners und in Anlehnung an die Waldorf Pädagogik hergestellt werden, keine Waldorfpuppen sondern ausschließlich Puppen nach Waldorfart sind.